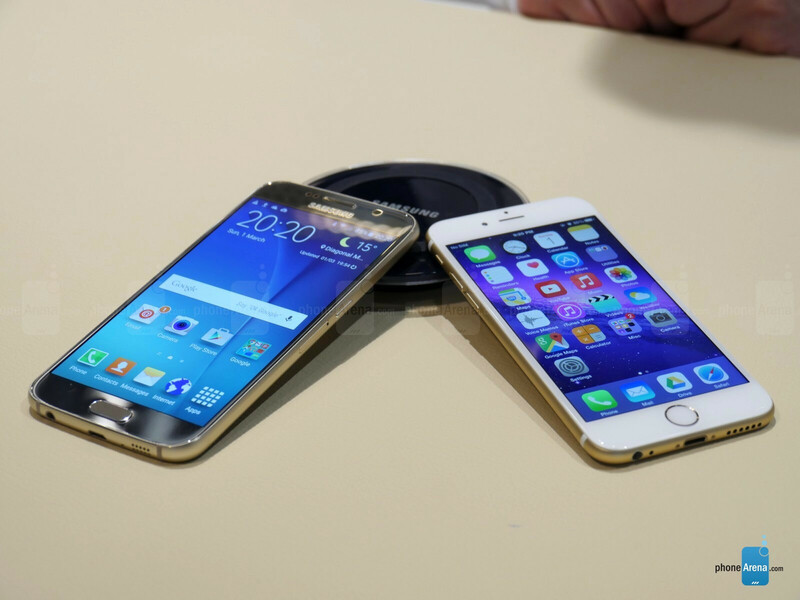 We're at MWC 2015, folks, and here in our hands, we have the best Samsung Galaxy S, and the best Apple iPhone ever! Now that the storm brewed by the S6's announcement has dwindled a bit, we're going to sit down with them and have a brief, but thorough first look at how the two are about to compete in the months ahead. While the Samsung Galaxy S4 and Galaxy S5 were the most forgettable Android flagships around, the Galaxy S6 is one to remember. This time, Galaxy S owners won't be holding creaky plastic in their hands. Instead, they will get to know something much more capable of standing up to the iPhone 6 - a blend of metal and glass that's premium indeed! Fully paneled with tough Gorilla Glass 4, and rocking a sculpted aluminum frame, the smartphone is durable enough to withstand the rigors on daily use, but makes no design compromises. And not only is the Galaxy S6 full-on premium, but it will come in a four lively colors too! But how will it sit in your palm? Well, dimensions-wise, the Galaxy S6 measures 5.64 x 2.79 x 0.27 inches (143.3 x 70.81 x 6.8 mm), which means it won't sit in there much worse than the iPhone 6 does - and that's despite the bigger display Samsung's challenger has. 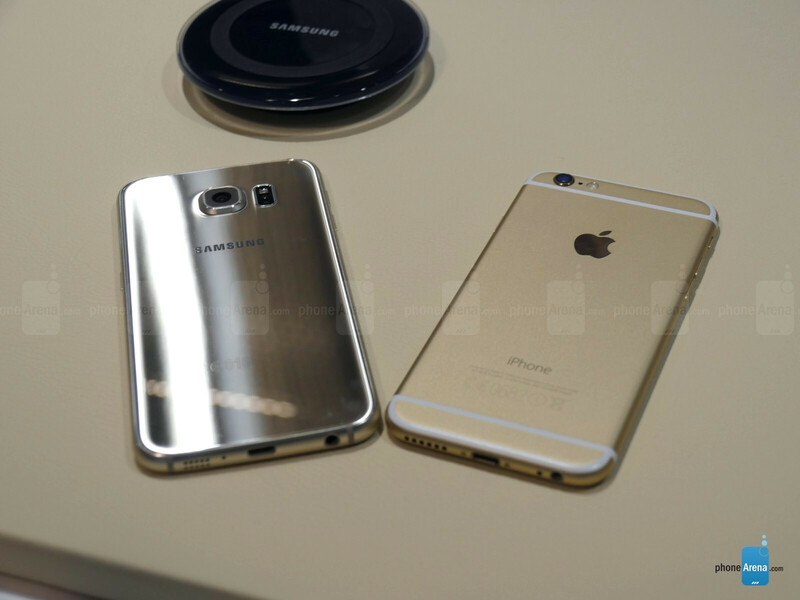 Now, how is Apple's crown jewel looking next to the Samsung Galaxy S6. It's looking very good indeed! The polished anodized aluminum, the smooth laminated display, and the shiny Apple on its back - the iPhone 6 is the best the iPhone ever looked! Everything about its looks and build quality has been heavily thought out - even those plastic strips that diminish the design harmony, but still fit in the picture. But it has to be noted that the Galaxy S6 has an important safety advantage with that Gorilla Glass 4 covering its front and back - you will have a much harder time scratching or destroying it than you'd do with the iPhone 6's bare aluminum shell. However, that glass back is prone to fingerprints! Anyway, the iPhone 6 sizes up to 5.44 x 2.64 x 0.27 inches (138.1 x 67 x 6.9 mm), which undeniably contributes to its excellent look and portability. Alas, it is sold only in gray, silver, and gold - which is a superb, but very limited selection of colors. Overall, the Galaxy S6 and iPhone 6's design is of very high quality. However, the Samsung Galaxy S6 still lacks that feel of uniqueness to it. The likes of Sony, Huawei, Meizu, Oppo, and Xiaomi had been making excellent variations of the metal/glass smartphone months (even years) before the Galaxy S6's announcement. Meanwhile, the iPhone has that Apple design quality that's being copied, emulated, studied, and otherwise taken advantage of by competitors - but never, ever matched. Even the HTC One M9 with its exorbitant looks doesn't feel quite as right as the iPhone 6 does. The display is the window to your smartphone's potential. The Samsung Galaxy S6 and iPhone 6 have completely different displays at the heart of their user experience. The S6, being stuffed with technology to the brim, rolls with a Quad-HD (1440x2560) resolution AMOLED display which packs a whopping 3,686,400 pixels on a panel that's 5.1 inches by diagonal! This results in a mind-boggling pixel density of 576 pixels per inch. Meanwhile, the iPhone 6 only has a 4.7-inch IPS LCD screen with a resolution - 750x1334 - that seems laughably low in comparison. Its pixel density is "only" 326 PPI. Does that really matter? To us, it really doesn't. We like sharp screens, but we consider a display's color reproduction, image quality, and brightness levels as more important than the number of pixels per inch. And to get an accurate assessment of how the Galaxy S6 performs in these aspects, we'll have to put the former through our display test first. Still, at first sight, the S6 exhibits something close to the color accuracy that the Galaxy Note 4 wowed us with. So things are looking pretty good! Raw spec comparisons between Android and iOS devices never made sense, because the two operating systems have vastly different architectures. Software optimization explains why an iPhone 6 with its dual-core 1.4GHz processor and 1GB of RAM can stand up to the Samsung Galaxy S6 and its monstrous 2.1GHz octa-core Exynos 7420 chipset (that's also paired with 3GB of super-fast LPDDR4 RAM) for all tasks that don't throw 4K video in the equation. However, Samsung might have worked out a serious performance enhancer for the Galaxy S6 - its UFS 2.0 flash storage is said to be 2.7 times faster than the current NAND flash memory standard, and it could bring a tangible improvement to app and content load times over other smartphones. In terms of built-in storage memory, both the iPhone 6 and Galaxy S6 have up to 128GB of the stuff - non-expandable via microSD card, sorry. At this point, comparing TouchWiz-skinned Android and Apple's iOS is, for the most part, pointless. They are two of the most popular operating systems in existence! You know full well what to expect from them. That's why we're going to focus on something different - it's called Samsung Pay. Yes, those rumors of Samsung working up a competitor to Apple Pay blossomed into truth! Samsung Pay, touted by yours truly as an "easy to use mobile payment service that will be compatible with more locations than any competing offering in a single application", is set to launch in the United States in the second half of 2015. It hopes to one-up Apple Pay with Samsung KNOX-protected fingerprint scanning and advanced tokenization security. The system works with both NFC and MST (magnetic secure transmission) terminals and is "device, merchant, and card issuer agnostic" - which probably means that it's supposed to work almost anywhere, with almost all terminals and merchants in the USA. Apple Pay is already successful on the US market, so we're rather curious whether Samsung Pay will be able to successfully attack its niche! In addition, the Galaxy S6 features a heart-rate sensor, which is able to measure your pulse or double as a shortcut for camera-related functions. That, the iPhone 6 doesn't have - but the upcoming Apple Watch will fill in for that role. For better or worse, those 20MP camera rumors didn't pan out in the Samsung Galaxy S6. It comes with a respectable 16MP unit on the back instead, while the front cam has been upgraded to 5 megapixels. The camera boasts Auto Real-Time HDR, Smart Optical Image Stabilization, and IR Detect White Balance features for advanced light sensitivity. In addition, it's got a brand-new 'Quick Launch' gesture which lets users simply double-press the home button and launch the camera app in 0.7 seconds (yes, Samsung measured it). Having had a great ride with the Galaxy Note 4's 16MP camera, we can't wait to take the Galaxy S6 out on a low-light photo taking spree! We also noted that the Galaxy S6 has a really fast camera app this time around. The iPhone 6, meanwhile, packs just an 8-megapixel main camera and a 1.2-megapixel FaceTime front camera. Megapixels aren't all that make or break a digital camera, though. The iPhone 6's camera - which is one the world's most popular cameras, by the way - is tuned to take remarkably sweet photos that nail the right balance between natural and artificially-sweetened colors. It also fares pretty good in the low-light shooting department, and takes pictures very quickly. In other words, it gives you everything you want from a point-and-shoot cam, but if you want larger photos and 4K video shooting, you'll have to pick up the Galaxy S6 (or an equivalent). The Samsung Galaxy S6 packs a 2550mAh unit, which sounds a bit less reassuring than we'd like it to. However, Samsung is giving it a pretty good prognosis! It should last a whopping 12 hours of Wi-Fi browsing, 11 hours of browsing over LTE, up to 13 hours of media playback, and up to 49 hours of music playback with the display turned off! But still, we'd rather let our proprietary battery test be the final authority on the matter. In addition, the Galaxy S6 comes with fully embedded wireless charging, working with any wireless pad on the market that supports WPC and PMA standards. Not only that, but Samsung also developed a fast wired charging solution that's able to give you 4 hours of usage after just 10 minutes on the charger. Once again, we'll have to see about that. As for the iPhone 6, Apple's flagship's strengths and weakness in the battery department are very clear at this point, and so is the Galaxy S6's absolute superiority over it in this aspect. The iPhone 6's 1810mAh battery is good for 10 days of standby time, 14 hours of 3G talk time, and an unimpressive 5 hours and 22 minutes of on-screen time in our battery test. In addition, Apple's flagship phone doesn't have wireless charging, neither a quick charging solution - and we think it's high time Apple figured something out to enable the latter. Our experience with Oppo's VOOC fast charger has made this feature a very desirable one in our book. The Samsung Galaxy S6 will be sold globally from April 10, in 32/64/128GB variants. At first glance, it's one of the best competing products the iPhone 6 is about to face this year, and if Samsung prices its flagship right, it might have a chance to win people back for the Galaxy S smartphone, the model citizen of Android phones. Those who don't have an iPhone 6, or aren't lusting after one, that is. S6 Specs are solid and leave iPhone 6 in the dust. So now that we taken care of the Stylemiesters and have a premium metal body......Samsung Galaxy S6, and a Samsung Galaxy S6 Edge, can we please have a Samsung Galaxy S6 Pro with: - Swappable battery - SD expansion slot and some of the other features power users need? This is just another market segment for Samsung. It will be interesting to see how the 5.0 - 5.4" handset segment does with: - no swappable battery - no SD card upgrade - no water resistance These are deal breakers for me too. The SD card is for not only expansion but also backing up and migrating pictures, data, apps, etc. locally and not depending on cloud services which leave you exposed to all sorts of hacking. Maybe these features are trending for the 5.5" and larger phones. Only time will tell. According to the article, it has a feeling of uniqueness. I guess that's something. I'm not sure what, but something. The iPhone bends, you hater!!! I hate to say it, but you're wrong. The iPhone will always have a huge loyal fan base that will stand in line for days and pay any price for technically inferior technology that they will claim is a better user experience, quality, resale value, style, etc... They might be partially right, but most of that loyalty will be based on being ingrained in that ecosystem (iReligion) and a need for peer acceptance, and validation for paying out the nose for iTems. So Samsung copy the protruding camera of the iP6? 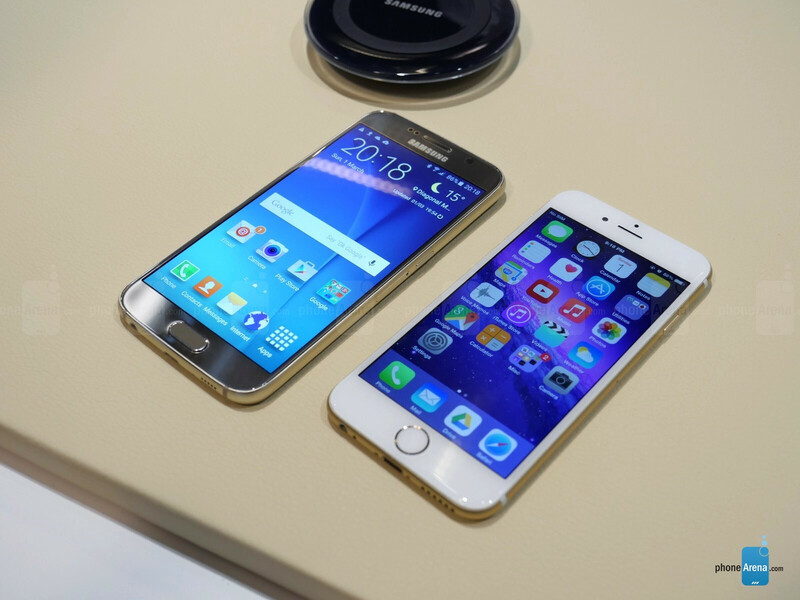 Isn't you guys hate the protruding camera of the iP6 and now samsung copy that because it is a trend set by Apple. You really have no idea what you're talking about, do you? lol. Sigh.Tards like this give me a headache. Pretty much every Samsung flagship for years has had a protruding camera. My Galaxy S3 did. But they have the hump in the middle, so when you pay the phone down, it doesn't rock on it. Did you really say that!!!!! Samsung has had protruding cameras dince the s2/s3 days!!!!! How blind and stupid are you! The more I see the S6, the more I like it. See you next year, HTC. What a biased review !!! Of course it's biased, it was written by Luis, which is why benchmark scores were omitted, because god forbid the iPhone to be shown in a negative light. Be patient, young Jedi, as Samsung will release a Sports version that will include the forgone features that people are lamenting about, just you watch. That will be the version of the S6 I will be getting. Can anyone explain how "uniqueness" feels? A copy but an inferiority. Fools will settle for knockoffs. "the iPhone has that Apple design quality that's being copied, emulated, studied, and otherwise taken advantage of by competitors - but never, ever matched. Even the HTC One M9 with its exorbitant looks doesn't feel quite as right as the iPhone 6 does." PA, please mention that your beloved iphone 6 has copied its design language from the mighty htc m8. SamSung this new launch of the Flagship Phone can see some shadow of the iPhone 6 last year 1. Samsung Pay VS Apply Pay 2. No SD card anymore 3. No Removeable Battery anymore 4. single touch fingerprint reader in the home button VS Touch ID But Sumsung's Fast charging and Wireless Charging technology will be seen in the next Apple's WWDC. But even this, Samsung still more vulnerable than Apple as it dont have the shield like Apple's iOS. Depend on advance's hardware to thrive will not last long, others phone's maker will soon to catch up. The only significant technolgy gap between Samsung and others Android phone maker perhaps the curved screen technology, but this is just a plus point not neccessary that users must chose. Design -> Galaxy Ace = Iphone 4 , Galaxy s6 = IPhone 6 !! I have several workmates who did rush and get the iPhone 6/6+, but had the S5 and Droid DNA and a Nexus 5. They switched back. All 3 are wishing they had waited to see what the new S was going to be like. The guy with the iPhone is on VZW Edge, so he says he will either just pay the phone up so he can do the Edge upgrade right away. He's getting the S6 Edge 128 as he has the iPhone 6 128. The other 2 say for sure they want to see the phones and if they are as good in person as they are online, they are gonna find a way to get them. Be hard tho because they are both on new contracts with their iPhones. But we have a couple people who haven't upgraded so they could easily get the S with using another upgrade available on the account, and we just past their phone to someone else who needs a new phone. So many !!! in this article!